Over the last few years the paradigm of how to approach cancer therapy has shifted from solely trying to mitigate cancer cell proliferation to incorporating targeting agents against the production of new vessels, which allow the cancerous cells to thrive. Current anti-angiogenic therapies focus on the earliest steps in these signaling cascades and try to prevent angiogenic molecules like vascular endothelial growth factor from reaching endothelial cells or hinder the activation of their endothelial cell receptors. One or more of the downstream signaling steps might be a signaling bottleneck that several angiogenic factors use in common and hence may provide a uniquely powerful therapeutic agent that circumvents the development of drug resistance. A maximum intensity projection of an XYZ stack taken every 5 µm up to a 45 µm depth. 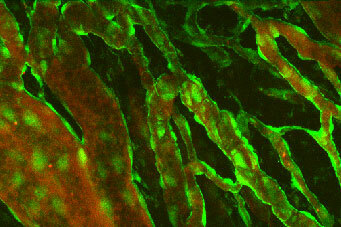 Two channels are merged together on this projection: the green channel shows Fura2-loaded cells and the red channel shows the vessels that were highlighted with intravenous injection with the red fluorescent molecule, TRITC-dextran. Studies have confirmed, through calcium-receptor blockades, the relationship between an increase in calcium influx in endothelial cells and the ability of the endothelial cells to perform motility, adhesion, or proliferation. The crux of this research project involves multi-photon laser scanning fluorescence microscopy (MPLSM), an optical technique that allows the non-invasive imaging of processes in living systems. Using in vivo MPLSM as well as a novel technique for the measurement of the permeability of individual tumor vessels, we are exploring the biochemical and biophysical processes essential for angiogenesis in breast tumors. 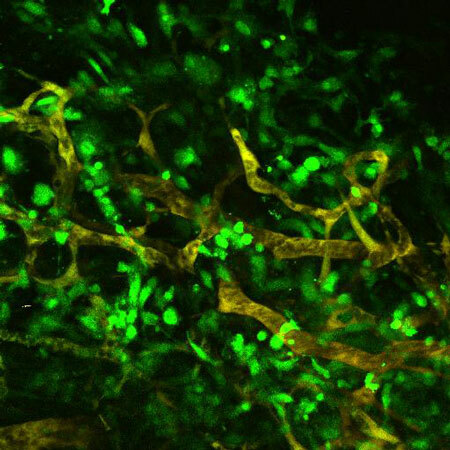 With a greater understanding of these processes we hope to optimize the ability of therapeutics to inhibit angiogenesis and hence inhibit tumor growth. Along the way, we are improving and adapting both in vivo MPLSM as well as the in vivo measurement of tumor vessel permeability. Researcher: Edward Brown III, Ph.D.